Something to consider Communication can be identified as the transfer of information on the part of one or more individuals that has an effect on the current or future behaviour of another individual. While on a game drive the other day, I had the fortunate experience of witnessing four White Rhino males gang up on another single male trying to enjoy a mud wallow in a small pool. While I have had many White Rhino encounters; I can honestly say that I have a new found respect for these animals of dinosaur appearance. As the five Rhinos stared each other down, they emitted sounds that I have never heard before. 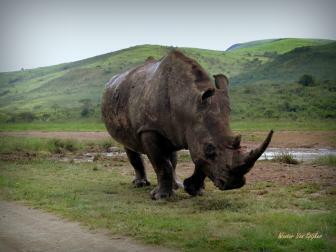 On a typical Rhino viewing, the animals seem calm as they graze and occasionally look up at the vehicle. Every now and then they seem to get a fright by our arrival and disappear back into a thicket. Not these five bulls; they snorted, squealed in a way that almost sounded like a crying puppies, and grunted with force and fury. The single male, feeling threatened by the other four but continuing to stand his ground, approached our vehicle; scent marking and scraping his feet on the gravel ground in a display of power and dominance; he tried to intimidate the other males by showing that he could take us on. He then returned to his mud wallow casually flopping down and bathing himself as if to show his care free attitude towards them. Not once did these animals engage in physical contact with each other. It has been argued that animals do not have language but communicate in many complex ways that humans will never fully understand. As I observed these Rhinos I realised the importance of visual expression, body posture, eye contact, scent and audio communication to creatures who do not have the ability to speak as we do. 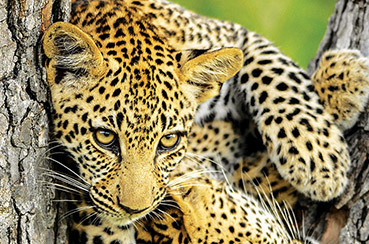 Many people perceive animals as dangerous and unpredictable; however most animals will avoid confrontation at any cost simply by using body posture. Essentially, we are animals, and although we have developed language are still in tune with our instincts in the same way these Rhinos were. With just our words we tend to have much misunderstanding. This is clearly evident in modern forms of communication such as texting and email. With face to face communication we are able to express so much more through our body language. We exhibit characteristics of dominance and submission, fear, excitement and attraction without using our words yet why do we find it so difficult to communicate with one another effectively? In my opinion, humans have lost their ability to communicate well because we have too many words and fail to take notice of our own body language. By paying more attention to animals we could really learn how to settle disputes and even avoid confrontation simply by using our body language in conjunction with our words. Being around for 50 million years, I think that Rhinos have a lot to teach us and by spending more time observing, improve ourselves.